1 - WE HAVE MOVED - Please visit https://GAWLERHISTORY.COM for our latest articles. We acknowledge Darren Peacock’s vision and expertise to create the "Now and Then" history websites from which we have evolved. 1.2 Why don’t you join Gawler History Team? 1.3.3.1 Click here to see our list of future guest speakers. 1.3.3.2 If you missed a previous Guest Speaker you can view many of them here on YouTube. 1.4 Just published. A great gift idea! 1.6 Look what's on our wiki! 1.6.1 Can you go through your Gawler photos and send them to us please? 1.7 These businesses support us. Please support them. 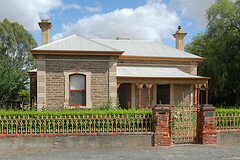 - WE HAVE MOVED - Please visit https://GAWLERHISTORY.COM for our latest articles. We acknowledge Darren Peacock’s vision and expertise to create the "Now and Then" history websites from which we have evolved. Also join us on Flickr to view our vast collection of historical images. Click here to view our Flickr albums. There are many albums that are still awaiting an appropriate article to compliment the photographs within. We would love your contribution, please email any article to mailto:bgthom@bigpond.com or chat with us at the next meeting - see below. Why don’t you join Gawler History Team? What to read the latest in Gawler History? Go to www.gawlerhistory.com and enjoy! and the display of the Gawler Heritage Collection in our new Civic Centre. Click here to see our list of future guest speakers. If you missed a previous Guest Speaker you can view many of them here on YouTube. Just published. A great gift idea! Town of Gawler kindly approves the use of this historic logo. 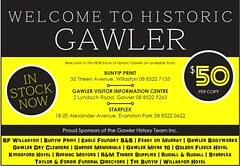 Please note - This logo is not the Town of Gawler's current branding and should only be used for historical purposes. Look what's on our wiki! Paul has so far photographed 888 of Gawler's lovely heritage homes. Click here to see them all. Can you go through your Gawler photos and send them to us please? These businesses support us. Please support them.